BUSAN -- Major imported car makers are showcasing their green car lineups and future eco-friendly vehicle plans at the ninth Busan International Motor Show that opens this week, aiming at the steadily growing local market. 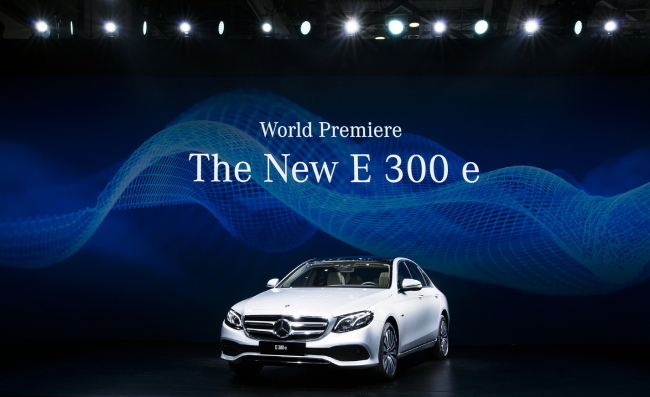 Highlighting the event was the world premiere by Mercedes-Benz Korea, which unveiled the plug-in hybrid version of its top selling 10th generation E-class, named the new E 300 e.
The automaker also revealed the concept EQA, the first compact-sized electric vehicle under the EQ EV brand, for the first time to Korean drivers. The firm is showcasing a total of 16 models including the new S 560 e introduced at last year’s Frankfurt International Motor Show. The unveiling took place at the biennial Busan International Motor Show, which officially opens Friday through June 17. Korea is Benz’s second-largest market for E-class luxury sedans. It comes as Daimler Group aims to lead electrification worldwide with the EQ brand, with a plan to roll out over 10 pure electric vehicles by 2022. In Korea, five plug-in hybrids will be introduced here by next year, the company said. The new E 300 e has a driving distance of up to 50 kilometers on pure electric mode with no emissions, and maximum output of 122 horsepower on electric motor. The new nine-speed automatic transmission-based third-generation hybrid transmission allows the plug-in hybrid to run on engine, motor or both the engine and the motor, the company said. Audi Korea, for its part, has set its sales goal for this year at a modest 15,000 units for the A6 launched last March and the A4 set for release in the second half of this year. 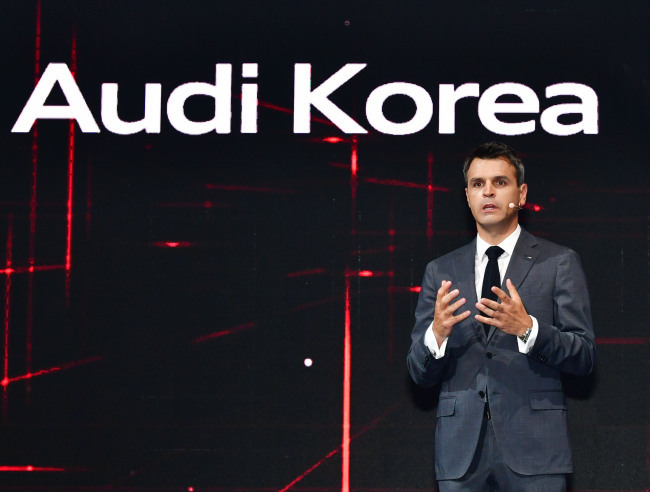 Striving to regain its status as one of Korean drivers’ highly preferred imported car makers, Audi Korea Managing Director Cedric Journel said during a press event Wednesday that the company will aim to sell over 20,000 units in 2019 on a total 13 new models, including the Q2 SUV and best-selling Q5. It will target over 30,000 units of sales in 2020, the executive said. The company introduced the Elaine concept car, the Q5 SUV, its smallest compact SUV Q2 and A8 flagship sedan for the first time to local consumers, in Busan. Due to a voluntary sales halt following the “dieselgate” scandal, Audi Korea sold 962 units last year, according to data from the Korea Automobile Importers and Distributors Association. In a bid to lead the local electric vehicle market, it introduced “Roadmap E Korea,” detailing plans to partner with local makers of electric vehicle chargers to set up about 400 electric vehicle chargers across 150 electric vehicle charging stations nationwide by 2021.